At the beginning of May, I thought it was going to be a long month, but the next thing I knew it was the end of May and quite a lot had happened! See my Instagram Round-Up for all the pictures I took, that gives a general overview of some of the things I got up to. Beauty-wise I definitely stuck to some old faithfuls and didn't branch out too much in what I was using, but a few things stood out. I bought this at the very beginning of April, the day after my birthday as a bit of a treat present to myself. I just could not resist it and I never tend to splurge money on bags, so I see this is quite the investment piece. 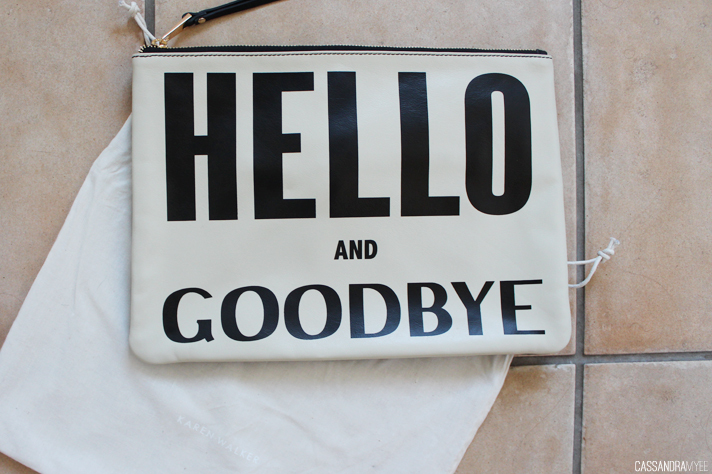 It is made of a lovely soft leather, with gold hardware and the best part is the amazing 'HELLO AND GOODBYE' printed on the front. 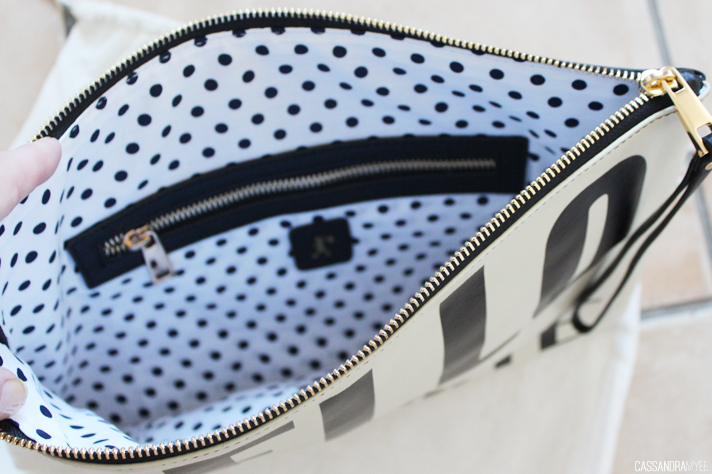 It is also a great size, you can easily fit in an iPad as well as anything else you may need. KW do three other versions of this (I also love the Faster, Better and Stronger one) for $220. I recently did a blog post on my wee collection I have got going of these (find it here) and this is the one I have been reaching for the most this past month. It is a nice natural shade of pink, I love the matte finish and they are very comfortable on the lips and last a few hours before a little touch up may be in order. 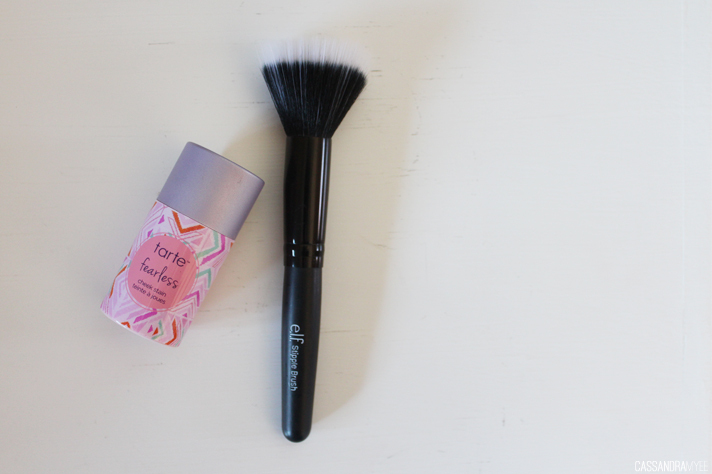 This one is a loving combo - the Tarte Cheek Stain (review here) and the e.l.f. Stipple Brush to apply it. These two together make a winning combo, the stipple brush picks up the perfect amount of product and disperses it evenly onto the cheeks. 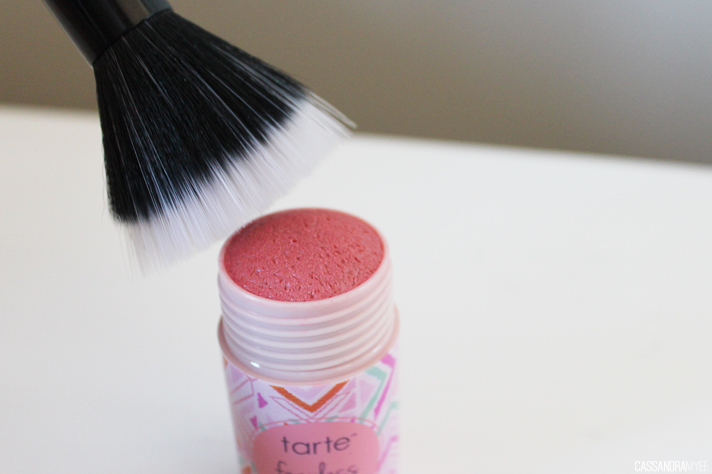 I found this is the best way to apply cream blush type products, and this Tarte Cheek Stain lasts all day on the cheeks and looks beautiful. I'd seen so many people rave about this concealer, but you can't buy it in any stores here in NZ, but I managed to nab this one brand new off a makeup buy and sell page on Facebook. 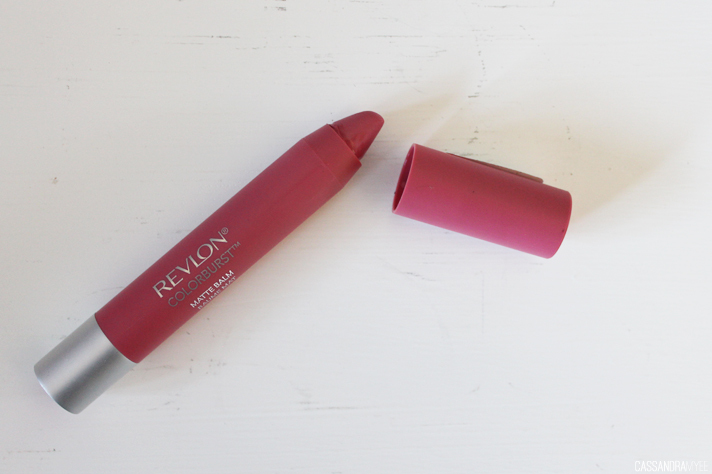 It was like love at first use, the top just twists to dispense product into the sponge top and then you can just easily swipe it under the eye. 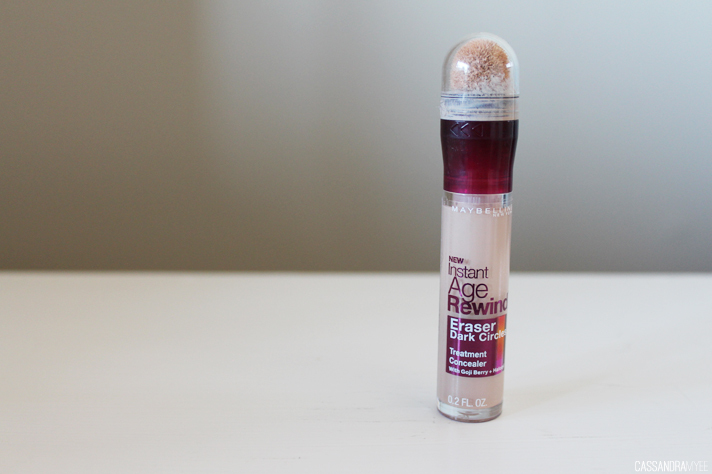 It blends out so easily, feels lightweight but covers dark circles straight away, it is a bit of a wonder product! After Lily Pebbles raved about this as her base coat of choice, I needed to try it out. The one I was using just wasn't cutting it, but this one is now a manicure staple. It goes on very thin, dries fast so you can apply your polish of choice straight on top, but the best thing about it as it prolongs the wear of any nail polish. I have gotten nearly a full weeks worth of wear from polishes that generally start chipping after a couple of days. It also protects the nails from getting all yellowy and gross, which mine get very easily! This Most Loved isn't just one thing, instead just a whole brand in general - Essie. 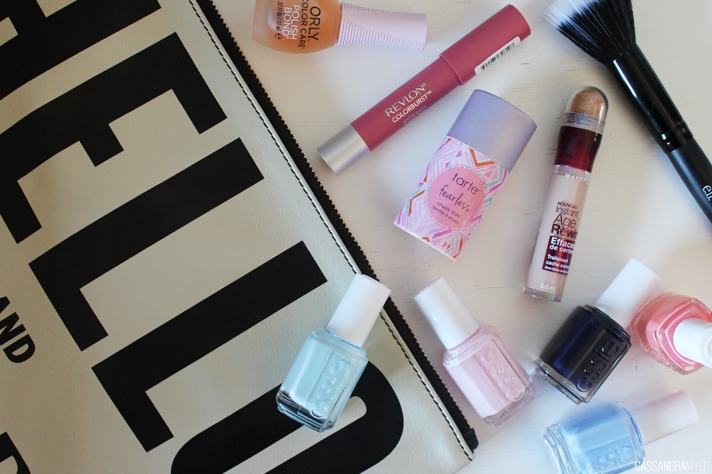 I just adore their polishes, I love the colours available and the bottles are simple and very pleasing to the eye. This month I have just been in a bit of a nail polish rut and have been reaching for these shades when I can't decide what else to use. Fiji has been on my toes all month, and I have had the others on at one point or another (actually they have all been featured in previous NOTD posts, see links above). I'd be pretty happy with a whole Essie stand in my room, one can only dream. Music wise I've still been listening to Iggy Azalea's album on repeat (featured in last month's Most Loved) but there have been a few songs I just can't get enough of. This song was introduced to me by one of my good friends and I can't stop listening to it ever since. It is quite chilled but still upbeat and it just has an addictive sort of tempo and lyrics to it. I can see this song becoming very popular, very soon! I am a huge Flume fan, and I do love a bit of Lorde and when this remix was released, it was a match made in heaven. It starts off really slow, the build-up is intense and amazing, and then when it just drops, oh man, it is good. Play it loud with really good speakers and bass to get the full effect and bask in music mastery. I could safely say drum + bass is my favourite genre of music, but obviously, it is not going to be everyone's cup of tea. This is utter drum + bass goodness, each time I listen to it I get in such a good mood and just wanna dance and jump around my room to it. And that wraps up May! What things did you love over the month of May? Have you tried any of the products I mentioned?